Now if we want to create heatmap graphics, how can we do it? Two popular web methods for displaying graphics are Highcharts and D3. 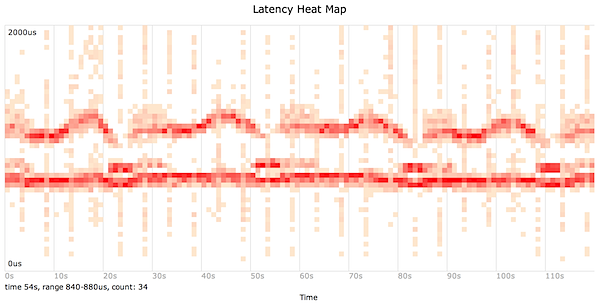 Two colleges of mine whipped up some quick examples in both Highcharts and D3 to show latency heatmaps and those two examples are shown below. The data in the charts is random just for the purposes of showing examples of these graphics in actions. and then it’s neet to be able to select part of the scatter and see how that selection stacks up in the histogram. I always find heat maps a bit difficult to read. It also could be a partial solution to combining hits in a bucket with time spent in that bucket. The heat map could represent one and the histogram could represent the other. Delphix finalist for UKOUG partners of the year Looking for past posts?